©ADH Publishing Ltd 2016 Tel: (UK) 01525 222573 Fax: (UK) 01525 222574 Email: enquiries@modelmilitary.com Address: ADH Publishing, Doolittle Mill, Doolittle Lane, Totternhoe, Bedfordshire, LU6 1QX, UK Model Military International is published monthly by ADH Publishing. Reproduction in part or whole of any text, photograph or illustration without written permission from the publisher is strictly prohibited. While due care is taken to ensure the contents of Model Military International is accurate, the publishers and printers cannot accept liability for errors or omissions. Inside the Armour Publications’ has announced their second book release: ‘Scratchbuilding Masterclass’. The book will be printed in February but ITAP is inviting readers to express interest in buying when it prints by emailing them at info@insidethearmour.com with the subject ‘scratchbuilding pledge’. No money will be taken until the book is ready to ship. Thanks to Inside the Armour Pubications for the information and image. Email: info@insidethearmour.com T-44 Soviet Medium Tank - 1:35 scale kit no. 35193 This kit includes a detailed fighting compartment, engine compartment and interior turret detail, workable individual link tracks and markings for ten options. The kit will be made up from 659 plastic, 15 clear plastic and 94 photo-etched parts. German Tank Crew (France 1940) – 1:35 scale kit no. 35191 This set includes five early-war German tankers comprising a total of 38 plastic parts. These appear to be ideally posed for a Panzer III or Panzer IV. Finnish Tank Crew. 1:35 scale kit no. 35222 This forthcoming set offers five Finnish tank crew members in casual poses. With the wealth of potential Finnish armour subjects and a sad lacking of crew figures, these guys will be very welcome indeed. PANDA 1:35 ZTZ-99A The ZTZ-99 is a Chinese third generation main battle tank. The tank entered People's Liberation Army Ground Force service in 2001. The ZTZ-99A is a vastly improved Type 99. Prototype testing commenced in August 2007 and the ZTZ-99A is believed to be the standard deployed variant today; upgradeable from Type 99. Its improved main gun may fire an Invartype ATGM. It mounts next-generation ERA, new compound armour at the top, a new active protection system, and has a new, larger turret with "arrow shaped" armour. The larger turret may have improved armour and a commander's periscope, and the tank may have an integrated propulsion system Both Bornco and HobbyBoss have already released 1:35 scale kits of this Chinese Main Battle Tank. Panda is the latest to join the busy market of ZTZ-99A models. Thanks to Kitty Hawk Models for the information and images. Challenger 2, live firing in the desert on a training exercise. MESOPOTAMIA 2007 Clive Osbaldeston gives an overview of equipment observed during Op Telic. Merlin (SH) the main troop carrying helo in theatre. A C-17 coming in to land at the Contingency Operating Base. Taking time out under some shade. Note the heat reflective material and extra armour on the turret. There is also a Heath Robinson wire cutter on the forward edge of the turret. Another blast from the past â&#x20AC;&#x201C; an M109 with a box of water next to the turret. Note the air con units on the rear and the lack of weathering on the vehicle. From a different era but still going strong, an M113 command post variant on fire control duties. Note the lack of weathering on any of the road wheels. Challenger 2 fitted with bar armour, muzzle cover and electronic mount for GPMG. Note the overall dusty look. CVR (T) with bar armour in the foreground with its Commander wearing the latest body in the back ground note the tow bar attached to the DROPS to the CVR (T). A WIMIC striped down Landover with GPMG mounted on top of the role cage. Note the storage and maps on the bonnet and the missing front grill. Two General Service (GS) Land Rovers - one missing its windscreen in an overall green scheme and the WIMIC and finished in an overall yellow scheme. Another blast from the past - a newly named Bulldog. This is an FV432 with a new engine and armour. It also has camera mounted GPMG. Mastiff troop carrying vehicle with bar armour fitted. Note the bowman antennas fitted at the rear. A selection of blast walls, some in better condition than others. Note the steel rope in the blast wall. These are used to move them into position. A Merlin (SH) undergoing some maintenance under its rapid erection hanger. AH-64 sitting outside in the southern Iraqi summer. Note that it is unarmed. A selection of shots of the many burnt out T-55s laying about the desert. My mate Dave adds scale! T-55 sat in the desert just as it was on the day it was abandoned. Note the rust around the fume extractor. A burnt out BRDM and two abandoned French troop carrying vehicles. A close up of an French troop carrier with yellow and darker stone colour and a white â&#x20AC;&#x153;OKâ&#x20AC;? sprayed on to denote that it has been cleared. Not only in yellow - just look at the selection of paint and rust on show. SPARMAX MAX-4 COMPETITION Win a Sparmax MAX-4 double-action airbrush in this free to enter competition! n TMMI’s January issue, Marcus Nicholls examined Sparmax's new MAX-4 airbrush and came to the conclusion that it represents fantastic value for money. The MAX-4 'brush feels solid, well engineered and finished to a high standard. The trigger offers satisfying resistance for good feedback and the instrument is perfectly balanced in the hand. The chrome-plating is flawless and screw threads feel smooth. The MAX-4 is suitable for all general modelling paint application tasks and its large paint bowl is ideal for extended spraying sessions. WIN THE MAX-4! Now, you have the chance to win your own MAX-4 by answering the question below and sending it in to us as our editorial address. How many colours is the new ARISM MINI compressor available in? For a clue, check out TMMI issue 242 or visit the Airbrush Company's website; www.airbrushes.com To buy the MAX-4; Please visit The Airbrush Company's website for a huge range of airbrushes, compressors and accessories; www.airbrushes.com Competition rules: Usual terms and conditions apply. Only one entry per household. No purchase necessary. The prize awarded is final and there is no cash alternative. Closing date for entries is 31st March 2016. Winners will be notified and the results published in a future issue. Q Andrew Judson adds a stack of aftermarket conversion and enhancement parts to Trumpeter’s 1:35 scale C1 Ariete Italian Main Battle Tank. uite some time ago, Trumpeter released this 1:35 scale kit of the Italian C1 Ariete MBT. It caught my attention and so I bought one, along with Royal Model’s aftermarket add on armour and started to plan the build. First I started to research this beast and I liked it even more as I did so. Models’ Italian Tank Crew, Bronco separate workable tracks, and finally a Lion Roar photo-etched set. I studied the instructions for a bit to determine any modifications that may be required when adding the after market stuff, and was happy to find that only a couple of small parts needed to be removed from the moulding or parts not used at all to be replaced with new bits. With everything sorted, I was ready to start on this project. The actual kit is quite simple to build, starting with the driveline and tracks. All went together well, though care was required when putting the tracks together as these were from Bronco, and workable, meaning not too much glue! Lion Roar photo-etched parts added to the engine deck. ARIETE The running gear is fast and easy to assemble. The kit’s rear side skirts. The impressive turret bristling with plastic kit detail. Royal Models’ resin upgraded side armour, complete with photoetched enhancements. The basic kit turret upper and lower halves. Much of the detail is moulded in place. beefy look. So far so good! Last was the turret, which also had a little extra work involved, in the form of some etch, and the metal RB barrel. The barrel was a challenge in itself, as it came in 8 parts, some etch and no instructions. To overcome this i simply looked at the kit part, and matched it all up. The end result, a very nice looking barrel. The remainder of the turret was a fairly simple build, replacing some kit parts with etch, such as side grilles and a few clamps. The two top mounted MGs and shields were put in place, and as the rest, all the base colours and weathering were done, now making it ready for the final weathering stages. The new armour glued to the kit. Very little kit surgery is required to install these. showing off the detail, and gave small spot pin washes in sepia and darker brown colours. Over this I then took various True Earth ground colours and spattered them up the sides, front and back; and other areas of the vehicle that would have been effected. These were then left to completely dry. While drying, I assembled the two Royal Model resin figures, and prepared them for painting. These went together very well, with just a small amount of Squadron Green putty in the joints and then primed ready to go. The model may be built in these three sub-assemblies to make painting easier. The tow cables are lengths of copper wire. Resin, photo-etched and scratch built parts have been fitted here. The Bronco links are tedious to clean up and assemble, but they are a vast improvement over the kit tracks. Note the hollow guide horns. Detail is excellent on both sides. Hand holds were bent from copper wire. Note the non-slip texture on the turret roof. Scratches have been added, then toned down, then re-applied. The crew figures are specifically for the C1 Ariete. Tail lights have been painted with Vallejo acrylics. The entire model was sprayed with Flat Clear mixed with a touch of Tamiya Buff. This was a very enjoyable project. The figures are from Royal Models and painted with Citadel acrylics. A close view of the dust and spattering effects. Over this I then sprayed Flat Clear over the entire vehicle with a touch of Tamiya Buff in it to give that last little touch with some over all fading. This was then put aside and left to completely dry over a 48 hour period. FIGURE PAINTING The last step was painting up the figures using the Games Workshop range of paints from Citadel, using a range of their crazy named greens, browns, and flesh tones. The faces were enhanced a little with Vallejo washes, giving that little final shading. Once painted, they were glued into place, and all was finished. ✓ Good detail; straightforward build. Full-sized reference of the C1 Ariete. D A C1 Ariete Mk.2 with upgraded armour. D A sandy Ariete and another indigenous Italian vehicle, the Dardo IFV. D Rear panel view of the C1 Ariete. D A nice front three quarter view of the upgraded Ariete. D Italian Centauro armoured car and Ariete in Iraq. D An Ariete in Iraq, up to its axles in dried mud! B An early version C1 Ariete. Note the thin side armour plates. Superb detail on the casemate side. Fine weld & recessed screw detail adorns this kit. Sprue breakdown. Dragon adds the final production Stug III Ausf. F for the first time. Graham Tetley checks out this new effort. Even the front casement gets the weld treatment. The armour filler parts for the front casemate. Detail on the fender undersides. Keep your Model Military International collection safe in a high quality binder. Each binder holds 12 issues. PART TWO – PAINTING, WEATHERING AND ADDING CREW The Editor finishes and adds stowage and Tamiya’s brand new US Army crew figures to his 1:35 scale M4A3E8 “Easy Eight” Sherman. he basic model and its upgraded armour plate was finished, but I had a few more additions planned before painting could get underway. The plastic and resin armour upgrade to the basic model. A number of fixed resin stowage items were glued to the engine deck. Packs and rolls were made from Kneadatite two-part epoxy putty. These were gently pressed into place between the fixed stowage elements, creating a gapfree naturally stacked pile. Kit detail parts have been added to the upgraded glacis plate armour. The model was sprayed with Tamiya Grey Primer. The upper and lower hulls are designed to “click and press” together. This actually works really well, and it is handy to be able to paint the vehicle in three sub-assemblies. Adding tracks later is easier too. A custom batch of Tamiya TS-28 Olive Drab with about 15% AS-15 Tan (USAF) was mixed and sprayed as the base coat. B AIR IDENTIFICATION I also decided to add an Air Identification panel to lend some bright contrast to the otherwise monochrome finish. Air Identification Panels were used in the European Theatre from D-Day until the end of the war as a way for Allied aircrews to distinguish German from US and British vehicles on the ground. The US Army Panel Set comprised a fluorescent pink/red panel and a fluorescent yellow panel. A blue panel was available too, but this was only used by vehicles behind the front lines. Each of the panels was backed with white, and this could be used in combination with the other colours. Two versions were available – either 12 feet long and 28 inches wide; or a shorter 6 foot long pennant. After the Germans became aware of the use of the panels, they were rotated in combinations of red, yellow and white according to a schedule that changed on a weekly basis. I chose yellow this time. vision blocks before I primed the model. Oh well, next time! The mixed lacquer Olive Drab base coat was applied with my Iwata HP-C Plus airbrush. A paler shade was then mixed by adding a little Desert Yellow. This was added in streaks and patches on the hull and the turret. Next, Sin Industries Filter P402 Brown for Desert Yellow was applied overall with a soft brush. Once this had dried, I applied a more selective dark brown wash to bolts, edges and other raised and recessed structural features. AK Interactive AK 045 Dark Brown Enamel Wash was used for this. One again waiting for the wash to dry, I readied J’s Work Chipping Effect Pen Set. The name is a bit misleading – it is really a selection of sponges attached to the end of a handle. There is a good range of density, so different effects are possible for a variety of applications. The sponge was pressed onto Vallejo Panzer Aces 337 Highlight Ger. (Black) on a paper palette, then the sponge was pressed onto paper a few times to reduce the effect before it was applied to the model. The effect was applied more heavily to edges and heavy wear areas. At this stage, the tyres of the road wheels, the spare track links, tool heads and loader’s hatch head cushion were all brush painted with Vallejo Panzer Aces 337 Highlight Ger, (Black). Sin Industries Filter P402 Brown for Desert Yellow was applied overall with a soft brush. A more selective AK Interactive Dark Brown Enamel Wash was added to bolts, edges and other raised and recessed structural features. The tyres of the road wheels, the spare track links, tool heads and loader’s hatch head cushion were all brush painted with Vallejo Panzer Aces 337 Highlight Ger, (Black). The kit’s full-length flexible vinyl tracks were used. Tracks were painted with a mix of Tamiya XF-64 Red Brown and XF-1 Flat Black followed by a selection of Mig Pigments and metallic track pad highlights. J’s Work Chipping Effect Pen Set was used to apply chipping to edges and heavy wear areas. carefully brush painted brown to complete the paint job. With the painting now complete, two thin coats of Alclad II Flat Clear Lacquer restored the matt surface and tied in the painting of the vehicle and the stowage. Weathering continued with a thinly sprayed coat of Tamiya XF-55 Deck Tan on the running gear and lower surfaces, including vertical streaks. This depicts dust. Painting the Air Identification Panel started with a base coat of Tamiya White Primer from the spray can, followed by Vallejo Model Color Yellow applied by brush. The packs, tool handles, track block and canvas covers were all picked out with Vallejo acrylics applied by brush. It all looks very stark in the base colours. It all looks more natural after weathering after highlighting using dry-brushing and picking out with paler shades of the base colours. Dark washes and dark edging has also been added. Dio Dump’s 1:35 scale chicken wire was just what I needed! The plastic chicken wire was sprayed, cut to shape and frames added from plastic rod. The panels of chicken wire were fixed to the model with spots of super glue, very sparingly applied. The basic vehicle, assembled, painted and weathered. The Air Identification Panel is not glued in place. The crew figure set is available separately. The bodies were assembled with Revell Contacta cement. The base uniform colours were from Vallejo. The head and helmet parts breakdown. The bodies received a grey primer coat. They have been temporarily attached to a paint box using Blu-Tack to make handling easier. A wash of thinned Mig Productions 502 Abteilung Abt.090 Industrial Earth oil paint was brushed over the uniform colours acrylic range. The heads and helmets were mounted on toothpicks and painted separate to the bodies. Details were picked out with Vallejo acrylics and a fine brush. The faces and hands were brush painted with mix of Panzer Aces 341 Flesh Base and 342 Flesh Highlights as a base for the skin tones. The clear goggles are a very effective idea. A number of accessory boxes are included with the figure Subtle variations in the colour of the jacket and set. The decal markings for the box are supplied too. the overalls. The Tank Commander. Note the division patch and Sergeantâ&#x20AC;&#x2122;s rank insignia. These are decals supplied with the figure set. The Commander has his map in his lap. This was cut from the kit’s instruction sheet. continued with a range of Vallejo Panzer Aces acrylics, mixed, remixed and reapplied on a trial-and-error basis – no magic formula here unfortunately! I have, however, provided a detailed list of the colours used in the Modelspec section following this text. The base uniform colours were also sourced from Vallejo’s acrylic range. A wash of thinned Mig Productions 502 Abteilung Abt.090 Industrial Earth oil paint was brushed over the uniform colours and allowed to dry before further highlights and shading with more Vallejo acrylics. The basic painted figures were sprayed with two coats of Future Floor Polish before the rank and division decals were applied to the sleeves. The heads were attached to the bodies at this stage. The figure painting was completed with two generous coats of Alclad II Flat Clear. At this point the clear goggles were painted and glued to the heads. In hindsight, I really should have added straps to the goggles. They appear to be miraculously hanging on with no visible means of support as they are! These two work quite well as a pair. Modelspec Tamiya 1:35 U.S. Medium Tank M4A3E8 Sherman “Easy Eight” European Theatre Kit No. 35346 Accessories and Decals Used: Tamiya 1:35 U.S. Tank Crew Set (European Theatre) Item No. 35347 Tank Workshop Item No. TWS 350022 .30 cal Machine Gun and Mount from Dragon Kit No. 6183 – M4A3E8 Thunderbolt VII Parts from Value Gear Stowage Sets Dio Dump Item No. DD006 - Chicken Wire Tools and Materials Used: Tamiya Extra Thin Liquid Cement Revell Contacta Professional Cement Selley’s Supa Glue Kneadatite Blue-Yellow Epoxy Tape Milliput White Two-Part Epoxy Putty Tamiya 10mm Masking Tape Tamiya Liquid Surface Primer Gunze Mr Surfacer 500 Microscale Industries Kristal Klear Iwata HP-CH Airbrush Evergreen plastic sheet Paints & Finishing Products: The kneeling crew member reaches the drive sprocket perfectly. me, although they would be mighty big in real life! The crew figure set is the perfect compliment to Tamiya’s excellent 1:35 Easy Eight. BOXER FROM TH Andy King reviews and builds Revell's new 1:35 scale GTK Boxer Ambulance Version straight from the box. ooking like something from the movie ‘Aliens’, the Boxer is an eight-wheeled AFV (Armoured Fighting Vehicle) that was produced as a joint collaboration between Germany and The Netherlands. The vehicle may be adapted for a number of different roles through the removal of the rear body or module, such as an armoured personnel carrier, Infantry Fighting Vehicle (with turret), command post, engineer vehicle or ambulance, which is the subject of this kit. WHAT’S IN THE BOX You get seven sprues moulded in green styrene, one clear sprue, a sprue of vinyl with the tow rope and mud flaps, eight vinyl tyres, a decal sheet and a length of wire sellotaped to the instructions. The parts exhibit some flash and mould seams and there a few sink marks here and there especially on the suspension but these are mainly hidden by the wheels, flash is also present on the vinyl parts (the tow rope really needs replacing). The tyres all have a seam line around the circumference but more importantly all the tyres in my example have some form of moulding defect and best replaced with resin aftermarket items. Detailing is okay on the exterior. Interior detail is confined to a very basic driver’s compartment but nothing in the rear module. If you want to have the doors open, be prepared for a lot of scratch building. Some of the many suspension parts. Basic driver’s cab detail is provided. The top of the ambulance cab. Nice detail moulded to the glacis. Hull roof with more moulded textures. The clear parts are a bit brittle – take care when removing them from the sprue. Flashy soft vinyl parts for the tow cable and mudflaps. The bright kit decal sheet. B glue for strength. There is no option for turning the wheels unless you embark on some serious surgery. The steering connector rods put up a bit of a fight too due to the sloppy fit of the steering - something to watch when you build yours. actually have you fit the rear module at the end of the build but due to the issues above I would do it before. After the module is in place it’s just a matter of adding the rest of the parts to the model and depending on where your vehicle is based you have the option of four warning beacons on the roof of the rear hull. These are just solid lumps of plastic and would have been much better if Revell had moulded them in clear styrene, the same goes for the periscopes. Also the frames that surround them are chunky, the tow rope that fits onto the rear door is too long and there is a huge gap between the front and upper hull and around the lights. The pin mark really needs removing for a better fit of the side of the hull. The hull is made up of multiple parts and needed tape to help keep it all together while the glue set. The driver’s compartment is basic although you can’t see much with the lid down. This is what the rear suspension should look like as the instructions are not very clear. Another view of the rear suspension showing how it fits. This is how far I got fitting the rear module, if I had pushed it any further it would have broken the model completely. This shows what happens when you use too much cyano glue. The plastic has ‘frosted’ due to the glue vapour and part of the rear hull has melted (note the position of the tow hook on the right compared to the one on the left). Oops! The driver’s windscreen with the crack on the right. The large gap between the hull front and upper armour plate. The lid of the driver’s compartment has a huge gap between the glazed side and the upper hull plate. Lovely screw head detail on the gun barrel..
Graham Tetley reviews Dragon’s latest Brummbar variant including superbly moulded Zimmerit. but, once opened up, you do notice the bare casemate walls. Consult your references if you want to add an interior but there will be a lot of work needed. The gun barrel has the correct extended armoured guard and some nice screw head detail cast in but, if you look closely, you can see the rifling in the barrel too. Nice! As an option within the kit you can display it with or without the side shields. The plastic rails are nicely done and certainly more rigid than etched equivalents. As with previous kits, we get etched nickel side shields with mounting holes cut into them but, although nice and thin, they are curved from top to bottom so be prepared to straighten them out before fitting. The instructions in this kit are not too cluttered but, as I have not yet built this, I can’t say if there are any errors or not contained within. Even the barrel has rifling. Superb weld & Zimmerit detail on the lower hull. Zimmerit on the casemate. Note the fine mold separation lines. …and the noticeable bend to straighten out. Only one etched fret is included. Dont expect a lot from the markings. P&P: UK; £2.00 Europe; £4.00 World-Wide airmail; £6.00 Cheques payable to: ADH Publishing Ltd. THE LAST SUCCESS – O Vladimir Adamec creates an evocative recovery scene during a late-war battle on the Eastern Front. bridgehead and was thus perhaps the last larger successful German offensive in WWII. Of course it could not alter the course of war and the inevitable defeat three months later. DIORAMA For this project I wanted to recreate a scene that could have occurred sometimes during this Hron bridgehead offensive. The diorama would show an attempt to recover one of the abandoned Jagdpanzers by a Sd.Kfz. 18t FAMO halftrack. WHO NEEDS INSTRUCTIONS? In common with many other modellers, I rarely follow instructions when building a model. I prefer to build the bulk of the vehicle first and add small parts and details afterwards. This order of construction reduces the risk of the small parts and photoetch details being knocked off during the latter assembly and painting phases. This process also helps me to visualize the overall shape of the vehicle, select the right type of scenery and position the vehicle on its base. I usually spent rather a lot of time "meditating" about the model, changing the layout and composition of the base before I arrive at the final composition and look. When building models, I prefer to assemble the model as completely as possible and then move on to the painting and weathering phases. However, the FAMO is one of those models that, due to its complexity and extensive visible interior, really has to be built in number of subcomponents. Careful planning is required to minimize number of these subcomponents and thus the amount of assembly required once the components are painted. In this project the planning was further complicated by the number of additions used, requiring careful study of multiple instructions sets. The following subcomponents were built separately: • Chassis and running gear • Wheels and tracks • Engine and engine compartment • Drivers' and crew cab • Cargo bed • Recovery spade In addition, a number of small parts (windshield, front engine grill with front fenders, engine hood, steering wheel, tilt cover and tarps) were kept separate as well until the latest stages of the build. The chassis and running gear were built almost straight out of the box. There is very little visible of them once the wheels are in place and cargo bed mounted, so I preferred to focus on the more visible parts of the kit. Tamiya’s FAMO is a great kit straight from the box but it needs a bit more detail if the engine compartment is left open. Extra detail included photo-etched parts, fine wire and some minor scratch building. The model was built in separate sub-assemblies to make painting easier. A tarp was laid onto the passenger’s side mudguard. Decalstar’s driver’s tilt cover was added to the front of the vehicle. folded metal frame for bed cover as well as rear gate locks. I decided to mount only the first three metal frames since I intended to fill the cargo bed with number of stowage items. The remaining two frames would be added after all the stowage items are in place. This way I could use the front three mounted frames to shape the tarp cover so that it copied shape of these supporting metal frames. The tarp was made from two sheets of rolled magic sculp, one for the top part and one for the front section facing the cab. In order to fit both the cab and cargo bed tarps I had to sand of the details on the rear of the cab cover and to thin the bed cover sufficiently as the kit is not designed with sufficient space to accommodate these additions. The FAMO ready for paint. The base colours are Tamiya acrylics. The basic shape was covered by a sanding compound followed by a thin layer of white glue, then soil. until the oil paint is spread so thin, it’s almost hard to distinguish. This way I create effect where the original base coat has just a slightly darker, rusty shade with gradual transition to the surrounding area. When applying multiple weathering effects using oil paints, make sure to let the kit dry for at least 24 hours between the steps. CONSTRUCTION – JAGDPANZER IV Dragon's Jagdpanzer IV (nr. 6397) is a fairly new kit and as such is very well detailed with the highest quality of moulding. Construction of the vehicle was actually one of my most enjoyable builds as it was very straightforward with almost no trouble spots along the way. I have ordered aftermarket photoetch set, but apart from the tool holders on the rear hull, most of it was left unused as the kit's details are very good. I added a few improvements kit's side skirts which are moulded in one piece were replaced with the individual ones made from styrene sheet. I have also added spare track link stowage brackets on both sides of the superstructure as this can be seen on a number of historical photographs. I also replaced kit's Magic Tracks with the Friul tracks and added two tarps at the rear of the hull. JAGDPANZER PAINTING AND WEATHERING The vehicle was painted and weathered in similar way as the FAMO. For the base paint I have added bit of Tamiya Flat yellow into the mix. My plan was to paint the Jagdpanzer in Brown/Green soft-edge camouflage, but since I wanted to avoid the risks of painting this camouflage in free hand, I had to come up with an alternative solution. I sketched the camouflage pattern on a sheet of paper and cut it out. I then attached the paper mask on the model using small bits of white-tack to mask the pattern, so that there was about 2 mm space between the model surface and the paper. I have repeated this process twice - for the brown and for the green layers. When airbrushing the brown/green areas, it is important to keep the direction of the airbrush perpendicular to the surface of the model to achieve the right transition between the base colour and camouflage. This was followed by the application of the white wash winter camouflage using hairspray method. Weathering consisted of the application of oil washes and chipping as described above. DIORAMA BASE For this diorama I was looking to build a small base depicting a rural setting, a typical country road that can be seen around villages in the Southern part of Slovakia. I wanted to keep the base relatively simple, but to add few visual points that would complement the vehicles. The base walls were made from a styrene sheets. Corners were strengthened with a styrene square rod attached along the inside of the joint. The base was filled from styrofoam and the top was shaped to form rough contours of the scene using utility knife. Top edge of the styrene walls were cut to copy these surface contours, allowing for the final ground layer to be added. Surface of the base was then covered with the sanding compound from Home depot. I only applied thin layer to avoid large cracks once the compound dried. To provide a stable base for the vehicles I have cut out two small planks from balsa wood for each model, and pressed them into the compound (has to be still wet) so that the vehicles would sit straight on them without gaps between the tracks and the planks. While still wet, the top of the compound was then covered with thin layer of white glue mixed with water (applied with large brush). Fine soil (collected from my garden) was then sprinkled on the top. Since the compound is still wet, it can be shaped to achieve the exact shape desired. Using tracks from a spares box pressed into the ground I have replicated track marks. I have added few more items sourced from my garden - small grass and bush roots were inserted to add realism to the sunken road scene and recreate the erosion effect on the slope. The stone wall supporting the road was build using small flat stones that were pressed into the drywall compound and the ground between the stones was then covered the same was as described above. The tree trunk is from the Armand Bayardi series. Grass is artificial one, it was cut very short and attached to the base with white glue thinned with water. Figures were supplied by my friends Tom Karnas and John Bayes. Weathering of the vehicles consisted of the application of oil washes and chipping. The wooden fence was made from small wooden strips weathered with multiple layers of Mig’s wood ageing solution. PAINTING THE BASE The painting of the base started with airbrushing a mix of Tamiya’s Flat Black and Flat Brown over the whole surface. This effectively acts as preshading, it is important that the surface is completely covered. On top of this layer I have airbrushed earth-coloured shades of brown, primarily using The column with the cross is from Plus Model. Dragon’s 1:35 scale Jagdpanzer IV was a pleasure to build. Fast too! The brown and green camouflage colours were painted with the assistance of paper masks. also from Plus models and was painted with acrylics. Upper part was painted in flat black and drybrushed with Citadel Boltgun metal acrylic. To replicate snow, I have decided to use Baking soda. It was attached with white glue mixed with water. This mix was first brushed or airbrushed on the ground and then covered with baking soda. Snow was represented by baking soda. Afrika Korps – Tunisia 1942 José Brito takes us through his painting and display of FeR Miniatures’ 1:24 scale Afrika Korps – Tunisia 1942 figure. have been modelling for the last 35 years and have already built hundreds of scale models. But from time to time, there is a project with a special meaning on my workbench. This figure from Fernando Ruiz Miniatures (FeR) is one of those projects. Why? Because the figure was kindly offered to me by my friend Fernando Ruiz. Also because it was offered to me in the Scale Model Challenge show 2015, in Netherlands (an event with a special meaning to me), and because, alongside a bust in the scale 1:10, this would be my first figure entirely painted in acrylics. FeR figures is already a wellknown brand in the scale model figure world. Their figures, besides being very original, offer flawless resin casting and the poses are anatomically very well made. Assembly is straightforward and the fit very, very good. Once the red primer was completely dry, the figure was airbrushed in several heavily thinned layers of Vallejo Surface Primer Desert Tan Base 73613. This colour is a good match to start painting the flesh tones. THE FIGURE This figure, the Afrikakorps- Tunisia 1942 in 1:24 scale, was sculpted by Eduard Pérez and the box art painted by Jaume Ortiz. With these credentials you can already imagine the quality of the sculpt and the quality of the piece presented in the box-art! The resin casting is flawless and the figure is presented in several pieces. In a short time the figure is full assembled and ready for painting. The entire figure was painted in Vallejo Acrylics and for the flesh areas I used their specific set “Face Painting Set- Acrylic colours for painting pale and dark skin”. Painting started by airbrushing several well thinned layers of Vallejo Surface Primer Pure Red 70624. This will form a good base for the upcoming flesh tone. THE BASE I am a diorama builder and for this project I decided to make a small base. For this I took my usual approach - a wooden base and the groundwork shaped from isolation foam. Isolation foam is lightweight, easy to work and very cheap. The parts and small rocks were pressed and glued into the isolation foam and the final place of the figure was decided. I also decided to use some Tiger tank parts in 1:24 scale. In this case the help and kindness of my friend Nate Esser was very important. Nate, from the USA, kindly sent me the necessary parts to complete this project. The ground work received a coat of Vallejo Dark Earth 26218. This is an acrylic textured paste and can be applied with the help of a brush or spatula. Being acrylic based, we can add water to change the consistency. Once the paste was totally set, the soil was airbrushed in Vallejo Surface Primer Desert Tan Base 73613. Small vegetation tufts were glued in place with the help of Deluxe Materials Rocket Hot glue solution. To achieve a dusty look, a thinned layer of Vallejo Surface Primer Desert Tan Base 73613 was airbrushed over the rocks and tufts. Please note that this layer must be applied very, very well thinned. The Tiger parts were airbrushed in Vallejo Surface Primer Black 73602 and then painted in Vallejo Acrylics to represent the German Desert Yellow. The weathering of the parts was achieved by applying thousands of small scratches with the help of a small sponge and oil washes from MIG Productions brand. Several colours were used in order to achieve a better and accurate final look. Here we can see the final effect on the Tiger drive sprocket. The groundwork also received several layers of MIG Productions oil and wash colours. This was always heavily thinned and several different colours were employed. Once the oil and washes were dry, several pigments from MIG Productions range were applied. The pigments were fixed in place with the help of MIG Productions Pigment Fixer. All we have to do is to apply the pigments directly from the jar and then add several drops of MIG Productions Pigment Fixer. The pigments will turn very dark and wet, but do not worry. Once the MIG Productions Pigment Fixer is well dry, the pigments will appear in full glory and the exact colour. CONCLUSION In conclusion, this project was an enjoyable challenge to me, not only because I was making a figure offered by a good friend of mine, but because I promised him that I would paint it entirely in acrylics. I have always painted my figures in oils, so this was totally new to me. I am happy with the final result and I think I am on the right track when it comes to figure painting, although I still have a long road ahead! I hope you like it. â&#x2013; This was a challenging project but a great learning process. CITROEN TRACTION 11CV STAFF CAR T Back in 2009, the Editor crafted a Staff Car with history from Tamiya’s just-released 1:35 scale Citroen 11CV Traction. he Citroen 11CV was employed by the French Army early in the Second World War. When Germany occupied France in 1940, the spoils of war included large numbers of this comfortable and versatile sedan. The Citroen was pressed into service as a staff car with the Wehrmacht and the Luftwaffe until the end of hostilities. Tamiya released a 1:48 scale Citroen 11CV back in 2005. This was a simple but attractive little kit that was a perfect companion for military or aircraft dioramas. Ever since 2005, modellers have been hoping to see a scaledup version. In July 2009, Tamiya released this classic car as a 1:35 scale injection-moulded kit. PT The main components of the car were together in no time. Assembly was fast and easy. CONSTRUCTION Frankly, there is not a lot to say about construction. With only 54 parts, the kit fairly flew together. Fit was excellent and the model was a pleasure to build. Prior to assembly the raised moulding seams on the centreline of each tyre were eliminated with a sanding stick, and the faint ejector pin marks on the door were covered with Tamiya Surfacer and lightly sanded. A bit of extra time was spent on the leather finish for the upholstery. Extra weathering for the floor and door interiors. All the windows were masked from the inside using Tamiya tape before the upper and lower bodies were glued together. The body was clamped while the glue set. The dark green layer has been sprayed thinly over the top of the Red Brown. Here we have the Red-Brown disruptive mottle applied over Dark Yellow. in pencil and completed the markings with a black marker. The characters were drawn intentionally uneven and rough around the edges. These were scanned into my computer at 600 dpi, saved as a Bitmap file and printed at 100% to test-fit for size. I sent the artwork off to a friend with an ALPS printer (a handy sort of friend to have), and carried on with weathering while I waited for the decals to return. When the decals arrived I wasted no time applying them. I cut close to the edges of the white markings, and the decals performed perfectly under a coat of Solvaset. The only problem was a very obvious dot-screen pattern on all the markings. My only option was to overpaint all the markings by brush. This was not really such a bad move, as it gave the decals a roughly hand-painted appearance. Vallejo white acrylic paint was used for this job. The model received a couple of coats of Gunze Flat Clear. I was not happy with the level of sheen that remained, so I added a small blob of Tamiya Flat Base to the paint cup to deliver a dead flat finish. Washes lend depth to the basic colours. The decals were applied over a gloss coat and touched up with white paint as required. AMPS-printed decals were commissioned from my original artwork based on a wartime photo of a recaptured Citroen Traction. The clear parts were masked, sprayed dark grey and glued to the model. PT CONCLUSION Tamiya’s 1:35 scale Citroen Traction Avant 11CV was a delightful little kit upon its release seven years ago and remains so today. It is worth building as a model in its own right, but can also be a versatile element for a vignette or diorama. The possibilities for painting and markings are almost endless too, from a civilian scene in mid-1930s Europe, to French or German military service, or even a Saigon Taxi! Whatever your predilection, I hope you have as much fun building your Tamiya Citroen as I had building mine! ■ A flat coat restored the dull finish. Tamiya’s Citroen Traction is a great standalone model or will be a useful addition to a diorama. Trumpeterâ&#x20AC;&#x2122;s 1:35 scale BTR-50K with some improvised armour and armament! Iranian SCUD in 1:35 scale. Bedford RL 4 Tonne General Service Lorry. Vietnam-era fork lift with its operator taking a break! A clever conversion – 1:35 scale wrecker Willys Jeep. Italeri 1:35 Mercedes L3000 with snow bow and radiator cover. Tamiya’s 1:35 scale “Tilly” with red bomb disposal markings. Another Tamiya Tilly, this time in distinctive Malta camouflage. Dragon’s 1:35 scale Mechanical Mule with Marine driver. Fact or fiction? I’d be interested to know! Su-122 wrecker in 1:35 scale. 1:35 scale 7.5 cm StuK 40 anti-tank gun on Panzer 38(t) chassis. RSO/03 Ambulance based on the Revell 1:35 scale kit and JP Hobby conversion. Italeriâ&#x20AC;&#x2122;s 1:35 scale Crusader AA Mk.III. Mirror Models’ Diamond T Wrecker and Jeep in 1:35 scale. Tasca 1:35 M32B1 Recovery Vehicle. Hobby Boss 1:35 T-36 Model 1934 in captured Finnish markings. A nifty Navy Jeep conversion. 1:48 Scale – A round-up of the latest news and releases SHOULD MODELS LOOK LIKE MODELS OR THE REAL THING? have been in a bit of a quandary of late. I often ask myself whether a model should look like a model or like the real thing. I started modelling for a number of reasons. The first was to try and emulate my late father and do something creative. As a kid I was a great fan of science fiction movies. The one guy that stood out for me was Ray Harryhausen. His stop motion films like “20 Million Miles to Earth” and “Earth Versus the Flying Saucers” had an incredible effect on me. The creatures and vehicles looked like models and I liked it. I was also a great fan of the Thunderbirds for the very same reason - the models looked like models. Moving forward, I was influenced by the work of Sheperd Paine who, with his “How To” pamphlets in 1970s Monogram kits, brought a whole new way of displaying and painting models that had previously not been seen before. Again, the models looked like models and again, I liked the “look” of them. I notice now that the trend is ultra realism. Now I know that the aim of every modeller is to create the most realistic piece imaginable, but sometimes reality doesn’t really translate into a good looking model. It’s a bit like seeing a really gritty and realistic depiction of an event on film. Some of the magic seems to be lost on me. I know that building plastic kits is little more than building and painting by numbers, but it is can be an incredibly creative hobby and begs the question, is it art. The jury is still out on that one, but I’ve seen some pieces that transcend from model to art. replicated look like the real thing. The very fact that a person created it, and that it is a replica, makes it look like a model or a painting. That is what makes it so enjoyable, as any part of that process can be slightly different than another and the result is something completely unique. Wise words? What do you think? Luke Pitt explores the wonderful world of 1:48 scale models and after market. Dan Moore upgrades Tamiya’s 1:35 scale Sd.Kfz. 4/1 Panzerwerfer 42. Brett Avants presents Trumpeter’s 1:35 scale 2S1 Gvozdika in Syrian service. Reproduction in part of any text, photograph, or illustration without written consent from the publisher is strictly prohibited. 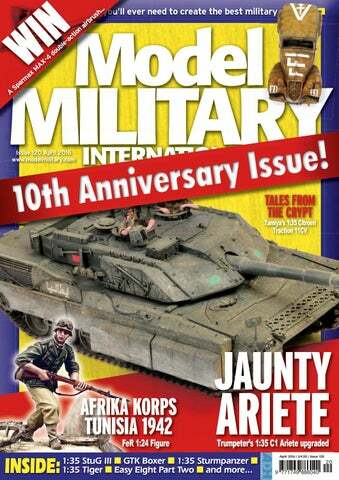 While due care is taken to ensure the contents of Model Military International is accurate, the publishers and printers can not accept responsibility for errors and omissions. FOR YOUR SAFETY Don’t forget, when using solvents such as glues, paints, thinners and cleaning agents, always ventilate your work area thoroughly and wear a face mask. When using power tools, side cutters or any tool that can suddenly break or create highspeed airborne particles, wear approved eye protectors with hard, clear lenses. Please always model in safety! Advertisements are accepted for publication in Model Military International only on ADH Publishing’s standard terms of acceptance of advertising, copies of which are available from the advertising department. Please write to the address above. All advertising, circulation and subscription enquiries should also be directed to the UK address above. Subscription rates are; 1 year (12 issues); £44 UK £56 Europe £69 Worldwide (Airmail) Binders; £8.50 plus postage (UK £2.45, Euro £4.45, World £6.45) For all orders, please call; (UK) +44(0)1525 222573 or visit www.modelmilitary.com Back Issues; Back Issues are available at the current cover price. See the latest back issues advert or visit www.modelmilitary.com The paper used in this magazine is manufactured at the Leipa Georg Mill and is 100% recycled using de-inked pulp. The mill conforms fully with the requirements of both FSC and PEFC and carries the full accreditations for their environmental policies. Tamiya’s 1:48 Schwimmwagen with figures by Luke Pitt, plus a Think Tank reference article from Bruce Culver. ...and much more! Due to many influencing factors, we cannot guarantee the appearance of the above projects, but we’ll try our best! The Last Post... TEN YEARS FOR MODEL MILITARY INTERNATIONAL Time truly does fly. With this issue, MMI is now ten years old. From T MMI Is he Waybac k sue 1 - Ma Machine y 200 6!